Originally published on Health Impact News. With over 80% of the U.S. food supply now reportedly contaminated with the herbicide glyphosate, many people are turning to USDA certified organic products to avoid this toxic chemical. Current USDA NOP (National Organic Program) standards do not allow the use of the herbicide glyphosate on organic crops. However, a new investigation by Tropical Traditions has revealed that the U.S. organic grain market is contaminated with glyphosate. Tropical Traditions has sold organic grains for years. After reading new research about the issue of "crop desiccation" done by using glyphosate on wheat and other grains just prior to harvest, Tropical Traditions decided to first test some commercial wheat products with wheat grown in Montana, North Dakota, and Canada. They sent the commercial samples to a well-known and respected laboratory to test for glyphosate. Next, Tropical Traditions tested the USDA certified organic grains from suppliers they had been using, sourced mainly from western states such as Montana and Idaho. Sadly, the presence of glyphosate residue was found in organic wheat and other organic grains, including organic barley, oats, spelt, and einkorn. The range was from 0.03 to 0.06 mg/kg, just slightly lower than the conventional grains that were tested. The only organic grains that tested clean were organic rye and organic millet. There was also one variety of organic wheat from small-scale farmers in Wisconsin that tested clean from glyphosate. Why Should We be Concerned about Glyphosate? Glyphosate is in 80% of our food supply in the U.S., and some scientists believe it may well be the most toxic chemical ever approved for commercial use. Glyphosate is now linked to kidney disease, antibiotic resistant bacteria, inflammatory bowel disease, obesity, depression, ADHD, autism, Alzheimer's disease, Parkinson's disease, ALS, multiple sclerosis, cancer, cachexia, infertility, and developmental malformations. It destroys the microbiome of humans and plants, which is the root cause of many modern diseases. Since commercial wheat and other grains today are NOT GMO plants, a direct spraying of an herbicide containing glyphosate would kill them. So how are these grains ending up with glyphosate residues in them? There are two reasons that a farmer wants to [use glyphosate on non-GMO crops]. It is for late season weed control in situations where he has patches of green weeds in the field that came up late. [This is commonly done with wheat and barley.] It is a little slower to harvest when weeds are present. The other reason involves late season snow. In the northern region such as in the Dakotas, in certain parts of Montana, and in the Prairies of Canada, there is a very short growing season. If it snows on the crop at harvest then you may lose the crop, because you can't get back into the field to do the harvest. In these regions, 70% of the wheat and barley are desiccated with glyphosate before harvest. [This kills the plant so that it will wilt and dry]. Farmers don't want to take a risk in losing their entire wheat and barley crop, so they will take a cut in yield and quality by using glyphosate a few weeks before harvest, and then harvest the crop early. Farmers don't realize how much they are contaminating that food or feed product when they do this. They will accept the cut [in quality and quantity of the crop], because that can buy them a week advantage in harvest. It's really more done for ease and planning. However, it is just the dumbest thing you could ever do from a health and safety standpoint. The USDA organic standards change so much that it is hard to keep up with what the latest standards are. For example, the EPA just increased the limit of glyphosate allowed in food in 2013, despite a loud public outcry. (See: EPA Raised Residue Limits of Monsanto's Glyphosate Herbicide). Tropical Traditions has learned that the USDA has now allowed a certain amount of pesticide and herbicide residue, including glyphosate, in USDA certified organic products as well. So it was not too surprising to learn that the levels of glyphosate found in organic grain products were within the limits allowed by the USDA for organic certification, which is based on a percentage of the EPA allowable limits for pesticides and herbicides. The organic standards for pesticide residue can be found here. The EPA establishes the maximum allowed levels of pesticides, or EPA tolerances, which may be present on foods. Although most EPA -registered pesticides are prohibited in organic production, there can be inadvertent or indirect contact from neighboring conventional farms or shared handling facilities. As long as the operator hasn't directly applied prohibited pesticides and has documented efforts to minimize exposure to them, the USDA organic regulations allow for residues of prohibited pesticides at or below 5 percent of the EPA tolerance. Since the EPA standards for glyphosate are already very high, it was not surprising to find out that the levels of glyphosate residue Tropical Traditions was finding in USDA certified organic grains was well within their limits. If both the EPA standards and USDA organic standards were too low for pesticide residue, probably more than 90% of the U.S. food supply would not be eligible for sale. It would be too contaminated. How is Glyphosate Residue Getting into Organically Grown Crops? This is the big question that Tropical Traditions is researching now, as they work together with organic grain mills and suppliers to try to determine how this has happened. There are several possibilities. The most alarming possibility is that glyphosate might be falling on crops through rainwater or irrigation. Some studies have actually shown that this is the case, particularly in the Mississippi River Basin. This is quite alarming, because it means all crops are suspect, not just grains. Herbicide and pesticide drift is also a possibility. Many organic grains are grown in the same area where conventional grains are grown, and where desiccating with glyphosate is practiced. This is probably done by crop duster aircraft, and the herbicide is drifting. 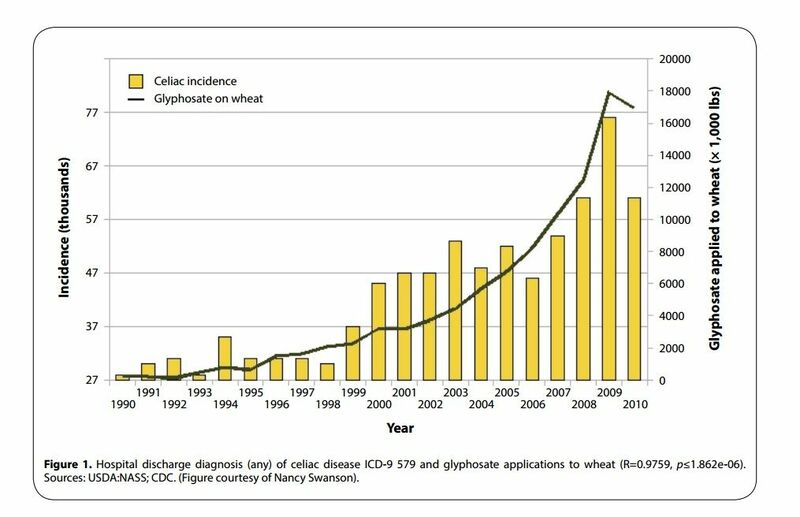 Other crops (besides grains) that Dr. Don Huber has stated use the practice of desiccating with glyphosate include: dry beans (chickpea, lupin, and faba), canola, field pea, flax, lentil, and soybeans. Organic varieties of these crops might be in danger of containing glyphosate residue. Tropical Traditions has already removed products from its product line associated with these crops, pending further investigation, and verification by laboratory analysis that they are glyphosate-free. We are implementing our own Glyphosate-tested program that we will soon be applying to all foods that are threatened with glyphosate contamination, and seeking out farmers and suppliers committed to meeting our standard of ZERO percent glyphosate residue. In Tropical Traditions' own testing of organic grains so far, they found that barley has among the highest levels of glyphosate of the organic crops, and this corresponds to conventional crops where the EPA has raised the limits of glyphosate in barley to a higher level than other grains. Beer drinkers beware! Not even organic beer is safe if it is produced in the U.S. Epidemic Digestive Health Problems in U.S. – A CALL TO ACTION! We are seeing unprecedented health issues in the U.S. today related to digestive health. Gluten intolerance diseases such as Celiac are probably just the tip of the iceberg. While the medical system wants to blame these conditions on genetics or food allergies, the truth is probably far simpler: our food has become contaminated and toxic, thanks to the chemical industry. The EPA and USDA have protected the Biotech industry and their cocktail of chemicals at the expense of the health of our nation. Nobody chooses to eat GMO food or food contaminated with herbicides like glyphosate. These policies which have raised the limits and allowed new chemicals to enter the market with no independent research have betrayed the American consumer. Action is needed to stem the tide of the U.S. federal government agencies that allow these chemicals to contaminate our food supply, and protect the companies who are earning billions of dollars in producing GMO seeds and toxic herbicides and pesticides. If these ballet measures pass will it force companies to start labeling products as GMO? Probably not. They will fight it out in the courts. But it will put a scare into the Biotech and Big Processed Food companies, knowing that consumers are waking up to this issue, and demanding GMO-free uncontaminated products. Secondly, the power to change the system relies not on politicians, but upon YOU, the American consumer. Americans are among the least knowledgeable people in the world in understanding the production of food. We also spend the lowest percentage of our income on food compared to any other wealthy country. For more on this issue, please see: YOU the Taxpayer are Funding the Agri Business Takeover of our Food Supply. You cannot fight this issue if you don't know what the true problems are. The American consumer is still the most powerful force in the U.S. to affect change. But it will not be easy. The federal government's assault on small-scale family farmers who desire to market products directly from the farm to the consumer is well documented here at Health Impact News. Billions of dollars are at stake, and a willing consumer is required for the system to continue as it is, with cheap subsidized mass-produced food full of toxins. You have a choice to NOT be part of that system, but it will take a lot of work. Tropical Traditions and their new yet-to-be fully developed Healthy Traditions network will do its part to identify healthy food, including their new Glyphosate-tested verification program. Tropical Traditions and the Healthy Traditions network will be working hard together with health-conscious producers and suppliers to provide nutritious uncontaminated food as an alternative to commodity food that is mass produced. Brian Shilhavy is the Managing Editor and Founder of Health Impact News. He has a BA in Bible and Greek from Moody Bible Institute, and an MA in Applied Linguistics from Northeastern Illinois University. He is the founder of Tropical Traditions.